The vast majority of video poker games have the standard set of 52 playing cards in their decks and as such when playing those games an initial set of five randomly selected cards will be drawn out of the deck when playing off an initial hand. 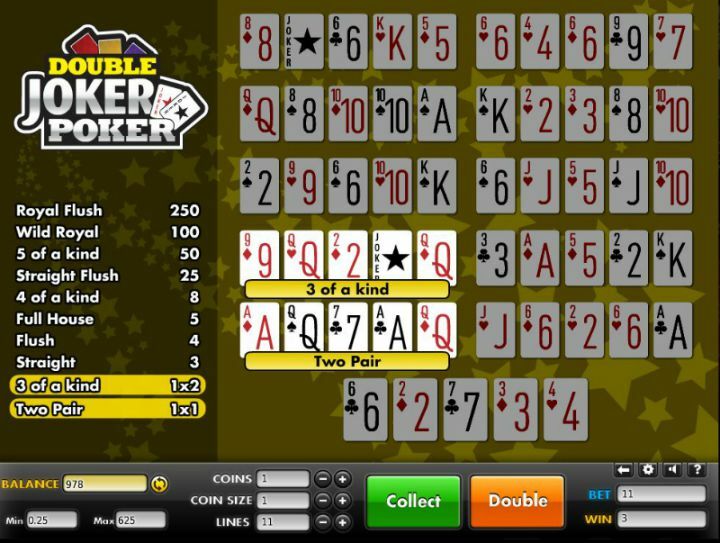 However, what you will find on offer on the Double Joker video poker game is a deck of playing cards that does not have the standard 52 cards in its deck but a set of 54 cards are in that deck. Those two additional cards are Joker cards, and when they are dealt out to any hand they will act as wild cards so they can and will stand in for any other playing card. The pay table on the Double Joker video poker game has been adjusted to take into account those two extra Joker cards! When you playing the Double Joker video poker game you should always play with all of the five coins in play and that will ensure you always get the best valued winning payout when you have been dealt out any of the winning combinations that are listed on the pay table of this game. One way that you are going to be able to afford to play for five coin hands is to set the coin value settings to ones your gambling bankroll and gaming budget can sustain for a large number of base game hands. So make sure you click onto the coin value button and pick out a coin value you are comfortable with and can afford before then play off each hand of this game! One final thing that may appeal to you when and if you do decide to play the Double Joker Poker video poker game variant is that each and every single time you have been dealt out a winning hand combination via the base game you will be able to take an optional gamble game in the hope of you being able to boost the value of that winning payout. So if on any base game hand you play off you have managed to achieve a winning payout and you do wish o try and boost the value of that winning payout then simply click onto the gamble button. What will then happen is the gamble game screen will be loaded onto the game screen and one face up card will be dealt out to you, and four facing downwards cards will also be dealt out to you. You then have to pick one of those four facing down cards and hope when it is turned over it is a higher valued card then the initial face up card. If that card is higher in value that the initial face up card your winnings are doubled in value and you can collect them or take the gamble game again, if the card revealed is lower in value than the initial face up card then you will lose what you won on the initial base game hand!